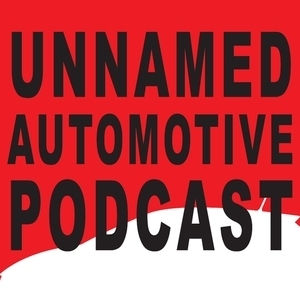 125 episodes of Unnamed Automotive Podcast since the first episode, which aired on October 19th, 2016. Sami heads to Germany to drive the 500 horsepower 2018 Mercedes-AMG GLC 63 SUV and watch human beings build engines at Affalterbach, while Benjamin pilots a Nissan 370Z through snow and ice and waxes philosophic on the aging star's place in the sports car universe. The pair then try to figure who, exactly, the 750 horsepower Chevrolet Corvette ZR1 is for, and whether it makes sense alongside the long-rumored mid-engine Corvette that is on the way to showrooms. Benjamin heads to Las Vegas to drive the all-new 2018 Hyundai Accent, while Sami pits the Toyota Camry and the Hyundai Sonata head-to-head in a battle of the family sedans that yields surprising results. Benjamin also spends time with both the Honda Civic Type R and the Nissan Micra on the wet, cold streets of Montreal. Benjamin spends a week in the desert at the Cadillac V Performance Academy, while Sami heads to Vancouver Island to sample the AMG Peformance Tour. Both compare notes on these factory-backed race driving schools. We hit the auto news hard this week to talk about the Polestar 1 electric sport coupe from Volvo and all the leaked goodies about the next-generation Jeep Wrangler. We also question the decision to name a car the 'Fine Comfort Ride,' and debate who, exactly, wants to smell like a Mazda with the company's new fragrance. Wrapping things up is Benjamin talking about his time with the 2018 Chevrolet Malibu Redline and Malibu Hybrid. Sami goes to Valencia, Spain, to drive the 2019 Audi A8, which insists on trying to drive itself, while Benjamin contemplates a week with the Mercedes-AMG E43, and all of the brand dilution that implies. The pair also discuss whether Honda is serious about actually building a sports car again, why weird transmission technology exists, and whether it's a good idea to drive a classic car on the race track. Benjamin discovers that you can't build a sports car from a parts bin after spending a week with the disappointing Fiat 124 Spider Abarth, while Sami questions whether the Porsche 911 is simply too good at everything it does to trigger a passionate response from owners and drivers. The pair examine all the quirks and weirdness that give similarly-priced sports cars their unique personalities, and wrap things up with an incredulous discussion about Jamie Oliver's butter-churning Land Rover. Benjamin and Sami trade supercar stories after driving the Ferrari GT4CLusso and the McLaren MP4-12C. They also try to figure out how many versions of the Challenger Dodge could possibly build, discuss how different the Challenger T/A really is from its line-up mates, and listen to Sami wax exuberantly about the Mercedes-Benz C300 Cabriolet. Benjamin drives the 2018 Jaguar F-Type 400 Sport, Sami offers first impressions on the completely-redesigned 2018 Lexus LS luxury sedan, and both talk about the unicorn-like Mercedes-Benz C-Class wagon before diving deeping to the world of Audi's scary empathetic artificial intelligence car that will know how you feel even before you feel it! Benjamin talks about driving the 2018 Mercedes-AMG GT R on the track at Bilster Berg in Germany, as well as his experience with the Mercedes-AMG Project One hypercar at the Frankfurt Auto Show. Sami discusses his strong feelings for the Mazda CX-3, and teases his drive of the redesigned Lexus LS. After a whirlwind August, Sami talks about attending Pebble Beach and Monterey Car Week, and driving the Lamborghini Aventador while Benjamin discusses his time on the race track behind the wheel of the 2018 Jeep Grand Cherokee Trackhawk. Also, bears. Sami goes in-depth on the redesigned 2018 Subaru Crosstrek, while Benjamin drives a Dodge SRT Viper ACR to the Roadkill Nights street drags. The pair also talk about what happens when Porsche loses a huge class-action lawsuit and has to buy sunglasses for thousands of its owners. This week guest Brad Iger joins Benjamin and Sami to talk about driving the 840 horsepower Dodge Challenger SRT Demon on the drag strip, and to muse on what other vehicles would be improved by the Demon's supercharged V8 engine. This week Benjamin and Sami both drive brand-new versions of cars they happen to own - the Cadillac CTS-V and the Toyota 86 - and then spend way too much time talking about hidden car features both real, and imagined.